The tobacco industry has aggressively marketed menthol-flavored cigarettes to African Americans, often targeting youth. 85 percent of African Americans who smoke, smoke menthol cigarettes. And African-American men have the highest rate of death from lung cancer when compared with other racial or ethnic groups. In recent years, there has also been a surge of other flavored tobacco products on the market, especially electronic cigarettes and cigars. There are over 7,000 e-cigarette and cigar flavors available for purchase. These flavored products undermine efforts to reduce youth tobacco use; 81 percent of kids who have used tobacco started with a flavored product, and over half of youth smokers use menthol cigarettes. To combat this problem, Bay Area cities are moving to end the sale of all flavored tobacco products, including flavored e-cigarettes, cigars and menthol cigarettes. Tell your Board of Supervisors or City Council: Protect kids. End the sale of all flavored tobacco products. Flavored tobacco products undermine efforts to reduce youth tobacco use and put a new generation of kids at risk of nicotine addiction and tobacco-caused death and disease. 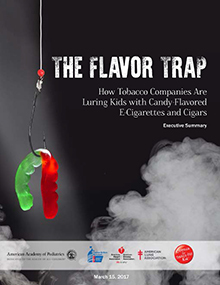 Over 80 percent of kids who have used tobacco started with a flavored product. Youth smokers are more likely to use menthol cigarettes than any other age group. Over half (54 percent) of youth smokers ages 12-17 use menthol cigarettes, compared to less than one-third of smokers ages 35 and older. Prevalence of menthol use is even higher among African American youth: seven out of 10 African-American youth smokers smoke menthol cigarettes.